In yesterday's morning missive, I painted a picture of a strong U.S. economy. We reviewed six charts from the latest NFIB survey that showed small business owners to be doing well, upbeat about the future, raising prices, and hiring. I could have titled the report, "What's not to like?" However, it is important to remember that the stock market is a discounting mechanism of future expectations. As such, some will argue that the current buoyant mood out there in small-business-land is already baked into the S&P 500's cake. I think the argument here is even stronger when you look at small-cap indices. As the above chart clearly shows, the small-caps have been on a roll lately. The move is likely tied to what the NFIB data portrayed - strength in small business. Yet, if one compares/contrasts a chart of the Dow Jones Industrial Average, the divergence between the large- and small-caps if fairly obvious. The consensus thinking is the reason behind the small-cap strength is that these companies won't be impacted by the potential trade war being waged with China, Europe, Canada, etc. This argument certainly makes sense. 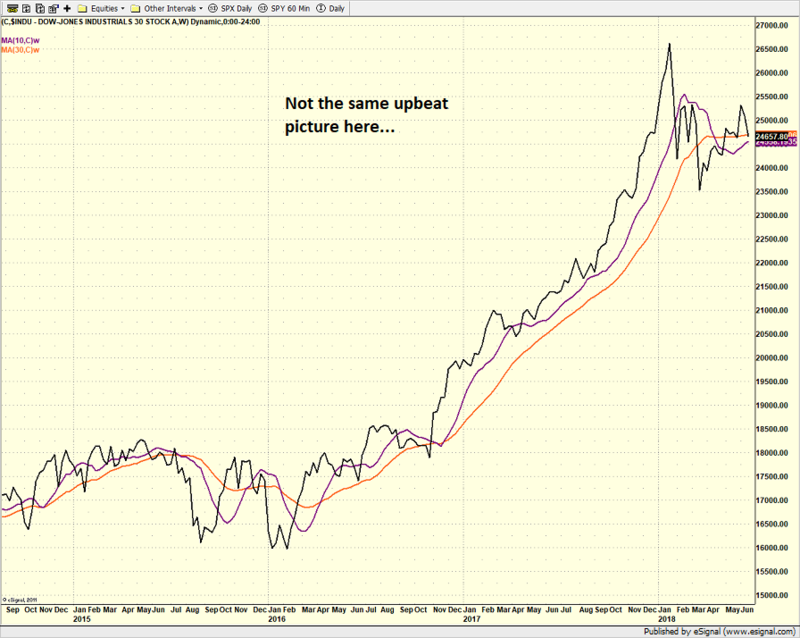 But, from my seat, the divergence between the two charts this year might suggest there is something more going on here. 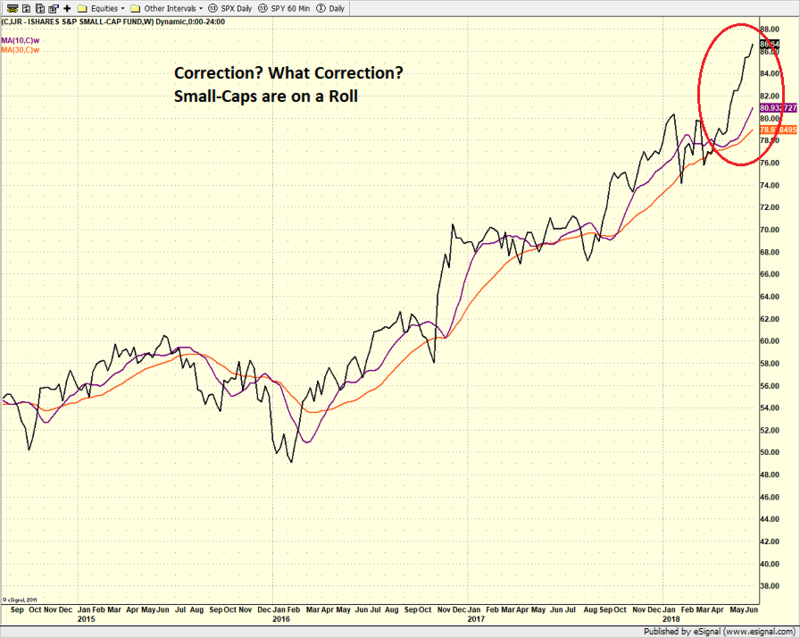 Are Large-Caps Worrying About Recession? One thought that comes to mind is the large-cap indices such as the Dow (which closed lower for a seventh consecutive session yesterday while the small-caps made a fresh new high) and the S&P are starting to fret about the next recession. The surveys I've seen in the last couple weeks are all singing the same song. In short, the consensus among economists is that the U.S. is likely to enter a recession in 2020. Yes, 2020 is a long way off. And a lot can happen between now and then. Never mind the fact that economists have rarely, if ever, accurately predicted the next recession. But, the bottom line is nobody wants to be caught off guard by a change in economic conditions. And since the belief is that recessions are the root cause of major bear markets, one can't be blamed for trying to stay ahead of the curve here. The general thinking among economists appears to be that the Fed will cause of the next recession. Jay Powell's gang of central bankers will go too far in their tightening campaign, which will slow the economy's growth. In turn, the consumer will panic and bury their collective wallets in the sand. While I personally don't put a lot of stock in this argument, I do recognize that economic data and "the narrative" of what's happening to the economy reach the consumer exponentially faster today than they did in the past (everybody's got the news on their phones now, whether they want it or not). And if we've learned anything from the steady stream of "crises" that have taken place since 2008, it is that the consumer can stop on a dime when things start to get sketchy. So, if this concern about recession gains momentum, I have little doubt that the worry about the next economic slowdown could become a self-fulfilling prophecy. In other words, if the public starts to worry that the bad old times are soon to return and as a result, changes their spending habits, boom, the economy will indeed slow. In reality, this is ALL just conjecture. More likely, the action in the large-caps reflects concerns about what appears to be a trade war. In fact, just this morning, I saw an estimate that a trade war could knock 1% to 1.5% off S&P earnings in the next year. But the key point I am trying to make on this fine summer morning is that things change - all the time. The current bull market in stocks won't last forever. The current expansion in the economy will end at some point. And the current weakness in the bond market will eventually come to a close. And so on, and so on. As such, it is important for investors of all shapes and sizes to be on the lookout for a change in the environment and the possible catalyst to the change. To be sure, I probably won't get this right in advance. But the key is to remain open minded as to why the current cycle might change and be ready with a plan when things actually do. Publishing Note: I am traveling on business for the next week and will publish reports as my schedule permits.